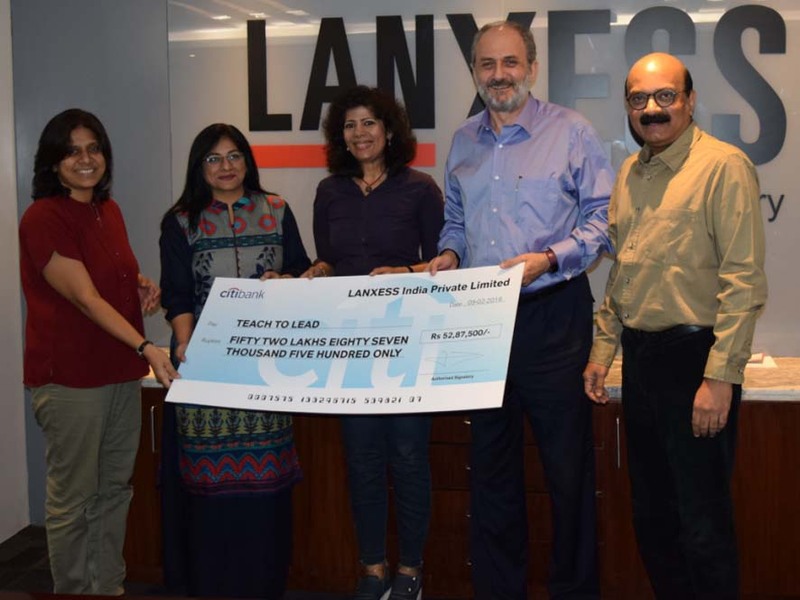 LANXESS India Private Ltd., a subsidiary of leading global specialty chemicals company LANXESS, has continued its association with Teach For India (TFI), which promotes the need for quality education throughout the country. The company has committed a sum of EUR 75000 (approx. INR 53 lakhs) per year for Corporate Social Responsibility projects in India as part of its pledged five year commitment to support the not-for-profit organization’s efforts towards providing quality education to under-privileged children. LANXESS relationships with Teach for India will continue to prosper as LANXESS always look forward to extend its supports towards health and education. Dr. Jacques Perez, Managing Director and Country Representative, LANXESS India Pvt. Ltd., handed over the cheque to Ms. Dimple Gujral, Chief Financial Officer, Teach For India, at LANXESS House in Thane on February 9, 2018. LANXESS has been contributing to TFI since 2010, starting with a sum of EUR 50,000 per year. LANXESS has supported over 15 TFI fellows (trained teachers on a 2-year full time paid commitment) and over 675 students directly so far. This contribution works as a support for the fellows who volunteer to teach the kids at the municipal schools since they generally have given up their jobs to fulfill these social commitments. LANXESS believes in empowering education and has taken many initiatives in India, in the areas of education, skills training and preserving cultural heritage. LANXESS has previously contributed to various NGOs, technical institutions and schools to support education in every region that it operates in.